NYC, 02/12/2019, 6:30PM. 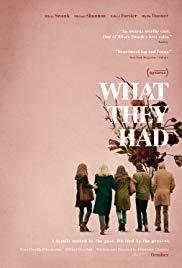 What They Had (2018): With Blythe Danner, Michael Shannon, Hilary Swank. Screening followed by a conversation with Chomko, producer Albert Berger, and Hilary Brougher of Film.